Reading through your comments on our latest post and giveaway gave us serious goose bumps. We started this blog without any expectations that our recipes would ever be cooked outside our own kitchen. And all of a sudden they are in Japan, Austin, Hungary, Nova Scotia, Singapore, Seoul, San Diego, Brisbane, Hillerød and 787 other places. It is cool beyond words, this internet blog thing. We are truly humbled by your massive response and encouragement. A huge congrats to our winner, Marie Boucomont from Paris! We are really sorry that we can’t give a blender to each and everyone of you. But we wanted to at least do something more, so we randomly picked 3 more names – Katherine Amelia from Sydney, Keilah from Nebraska, Candela from Argentina. You guys will get a signed copy of our book! We’re curious how high today’s recipe would rank? It is not impossible that it actually might have made it on to the top 15. Even though it is one of our more messier creations, it is also a really wonderful mix of flavors and texture combinations. 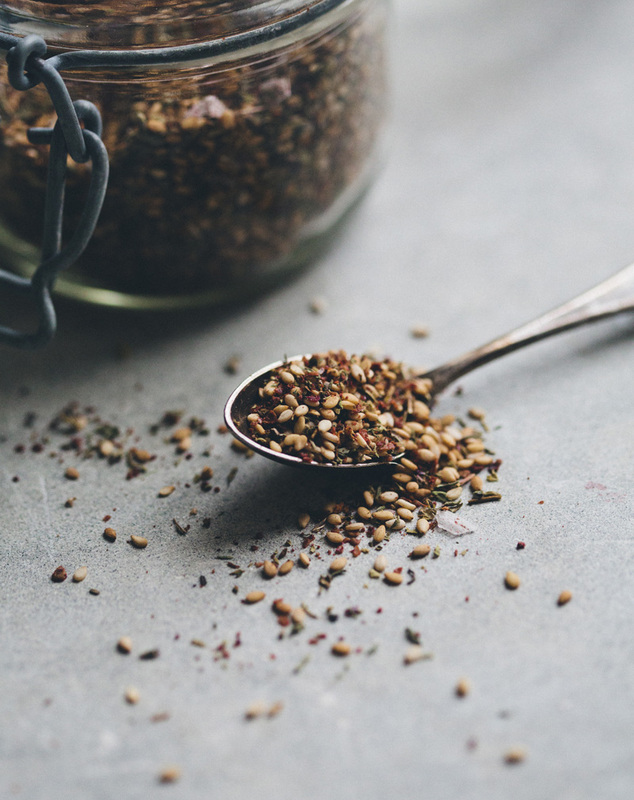 Za’atar is an ancient middle eastern spice blend made from lightly toasted sesame seeds, sun dried herbs and ground sumac. If you haven’t heard of sumac before, we can definitely recommend trying it. Ground sumac comes from dried sumac berries and tastes like a groovy combination of tangy sour and fruity. Use it in marinades, dressings, za’atar spice blends or on oven roasted vegetables. 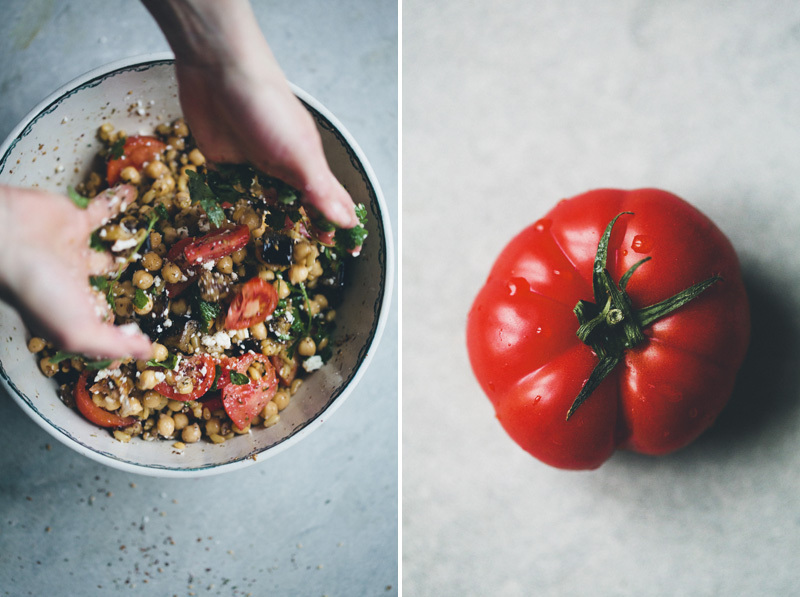 This salad is made with chickpeas, wheat berries, sumac grilled aubergine, juicy tomatoes, parsley and goat’s cheese. Everything is drizzled with olive oil, lemon and this amazing za’atar blend. If you close your eyes, the scent of the lemon and za’atar will hopefully bring you to a busy Middle Eastern souq. 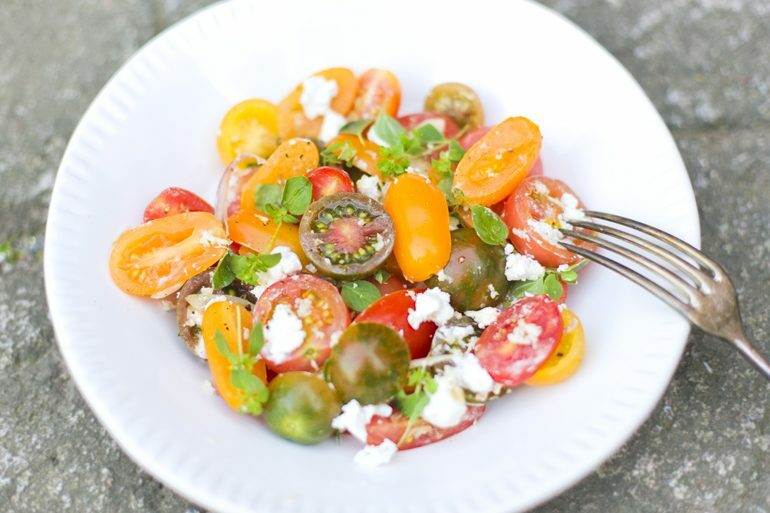 Another thing that we love about this salad is that you get to dig your hands into it when combining. 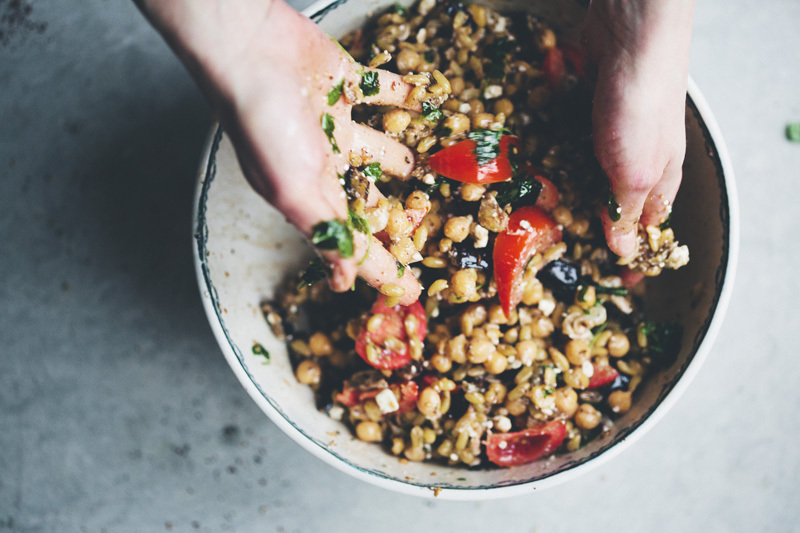 Messy hands = The best salads, and you can quote us on that. Soaking and cooking chickpeas / wheat berries: Place chickpeas and wheat berries in two bowls, cover with twice as much water and let soak overnight. Rinse and drain, place in two cooking pots, cover with water twice the amount of chickpeas/berries, add a pinch of salt and pepper and cover. Bring to a boil, then remove the lid, lower the heat and let simmer for approximately 1 hour. Test to see if tender. It may vary in the cooking time. Drain and allow to cool. Roasting the aubergine: Preheat the oven to 200°C / 400°F. Cut the aubergine into 1/2-inch / 1 cm squares. Place on a baking tray, drizzle with olive oil, sumac and cumin seeds and toss with your hands so every aubergine are lightly coated in oil and spices. Bake in the oven for around 20 – 30 minutes or until golden and soft. 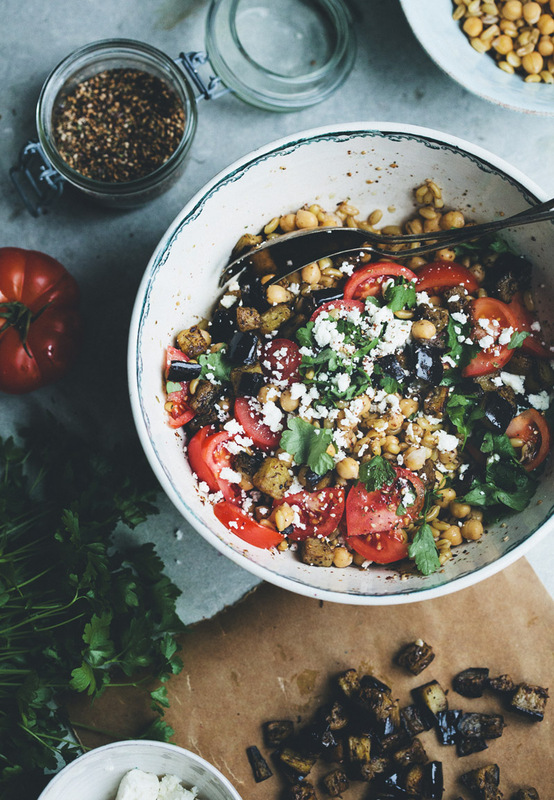 Making the salad: Mix cooked chickpeas, cooked wheat berries, roasted aubergine, tomatoes, parsley, olive oil, lemon juice and Za’atar in a large serving bowl. 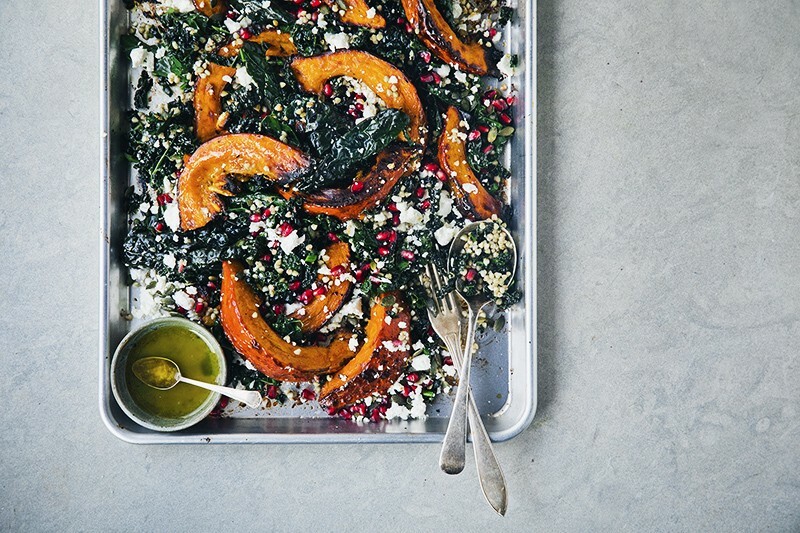 Toss with your hands until well combined, sprinkle with goat’s cheese. Serve. 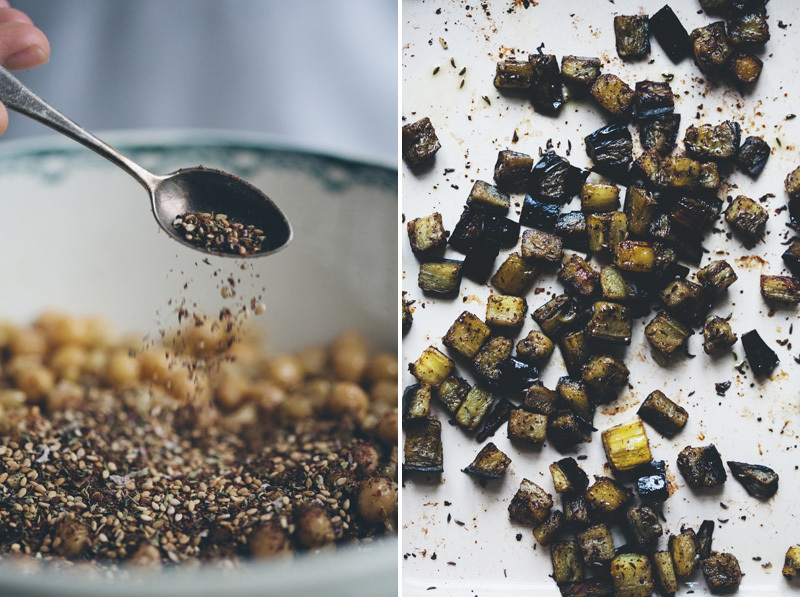 Making the Za’atar: Place sesame seeds on a skillet and gently toast on low heat while stirring. Remove from heat, allow to cool and mix with the rest of the spices. Place in an airtight glass jar. Keeps for months. PS. We just found out that Luise made it onto Babble’s Top 100 Mom Food Blog list. She is actually #3 on the list! Discover more blogs and see the full list here. Just made this (with quinoa as I'm coeliac). I live on the south coast of Western Australia and we're now in Autumn so the warm earthy flavours were so perfect for the rainy windy night we're having. Thank you so much. mmm cant wait to order some sumac and other spices!!! i had a odd question for your... answer if you please: do you guys drink coconut water? what is your take on the substance? do you think its healthy? anyway thanks for the recipe! This looks so good - like all your recipes! One of my top favorite spices is zatar - I especially love the sumac in it. 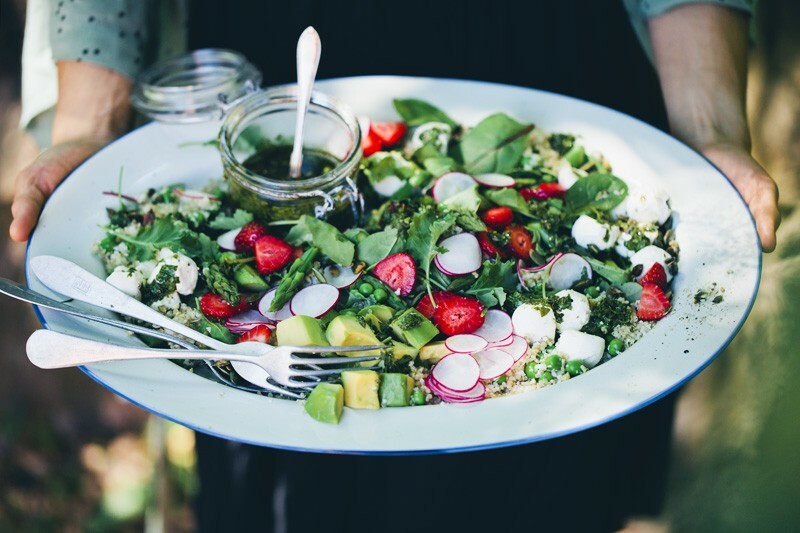 This will be a great salad to try - can't wait! I'm so happy!! =) and this salad looks wonderful... Thank you Luise, Elsa & David ! Ilove your beet root burgers, I always have too many beet root from the garden and welcome all uses of this delicious veg! What a wonderful recipe! I've pinned it already and can't wait to give it a try. It's such a great combination of flavors! This looks wonderful, but I am allergic to eggplant. What would you suggest as a substitute? Oh geeeeeeez I'm lervin' this. Bummer, I was so hoping to win. Oh well, at least I got an exciting new salad recipe to try. Looks amazing! Wow this salad looks amazing! 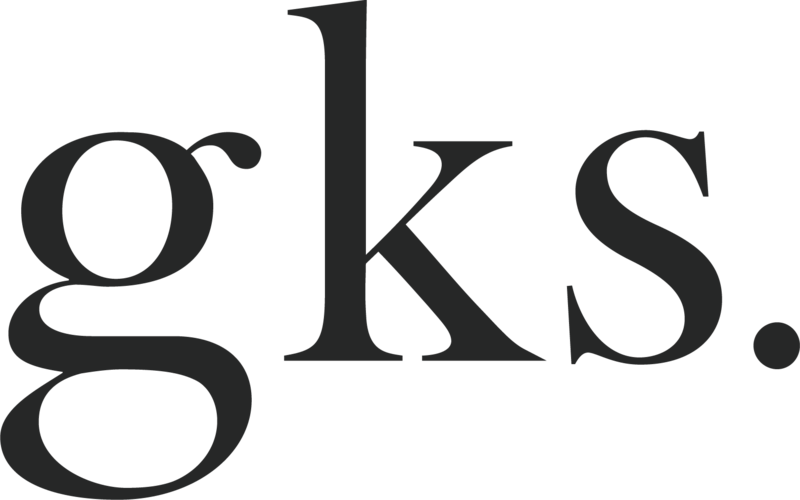 It is no wonder, with such a blog, that you have so many international readers! Can't wait for summer to try this recipe! Thank you again and again for sharing your passion with us. So excited to see this recipe! I bought a bag of sumac on a trip to Istanbul and my Mum just brought me back freekeh from a trip to Jordan (I always buy foody souvenirs when I go away :)). 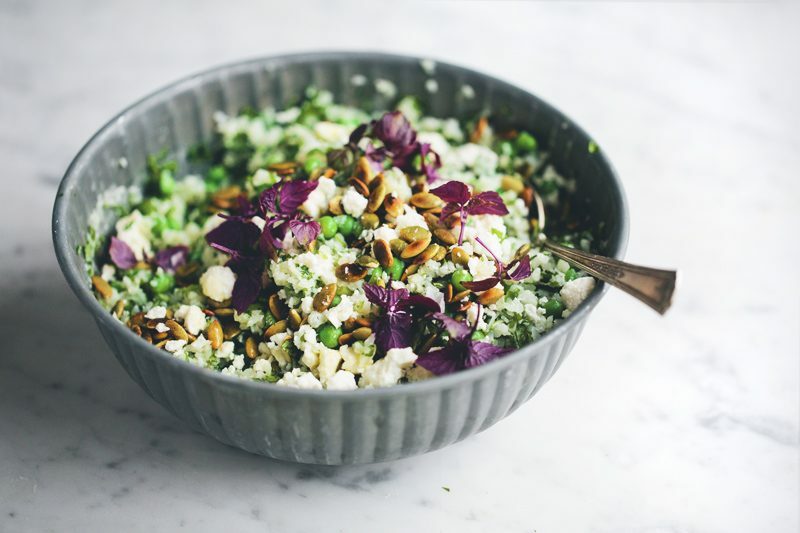 I haven't used the freekeh yet but this will be the first dish I make with it. Beautiful recipe guys! I have some Thyme drying and my Sumac is ready to become even more delicious. I love getting my hands in there. With a particularly good salad i will always eat with my hands- a much more sensual experience. Welcome to our Green Kitchen. Here we cook and eat healthy and simple vegetarian food with natural ingredients, whole grains, good fats, fruit and vegetables. All content is © 2019 by Green Kitchen Stories. All rights reserved. Design by Marta Vargas.